I made this last night, adapted from another recipe and it. was. amazing. SO flavorful. And the tomatoes! Ah…I’m drooling right now thinking about those tomatoes. They were so rich and juicy and awe-inspiring. I used Fire Roasted diced tomatoes and I think that made a huge difference. They are dreamy. I also used artichokes packed in oil with seasoning. I have never actually cooked with raw artichokes but it’s on my to-try list this summer. I big fat HEART artichokes so I add them to everything. 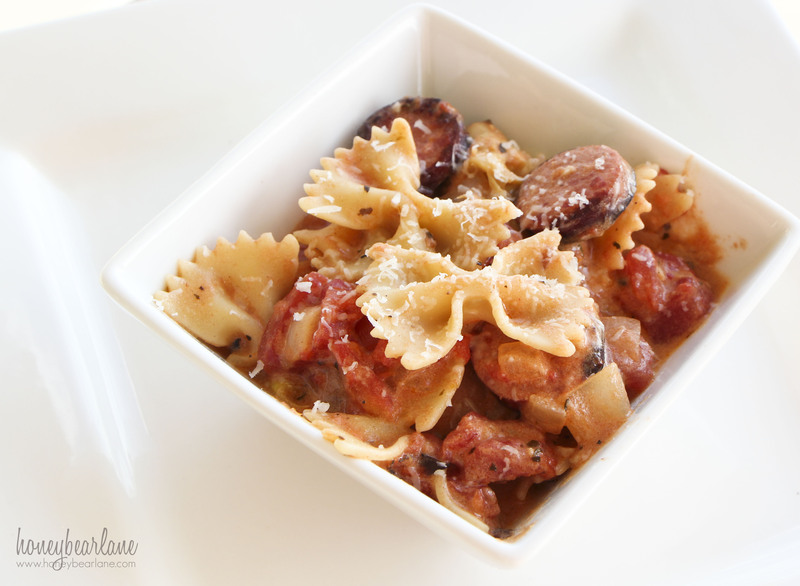 Farfalle, or bowtie pasta, is one of my favorite pastas. It’s a fun shape and has a great texture. 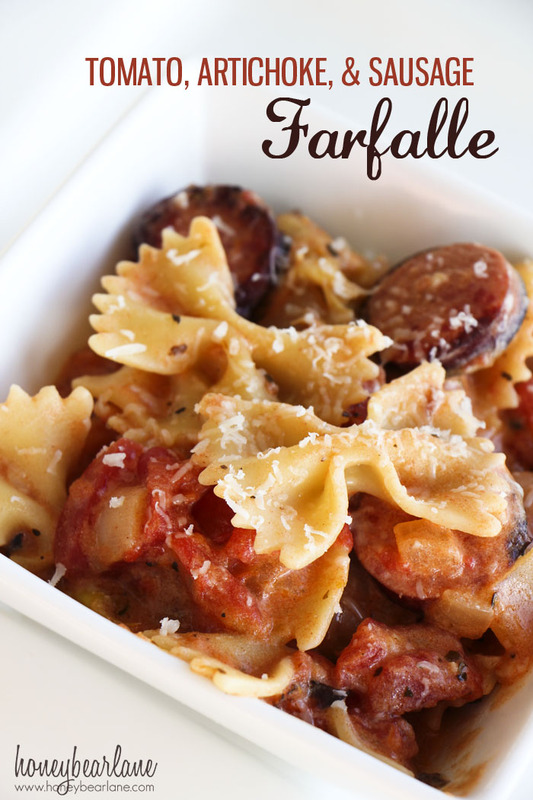 I use farfalle way more than any other pasta! This recipe also comes together VERY quickly…only about 30 minutes! Sautee sausage and red pepper flakes in a little olive oil--I cut my sausage link into little circles first). Then add chopped onion and garlic and sautee 2-3 minutes or until onion is cooked through. Then add artichoke and sautee for another 2 minutes. Then add the two cans of diced tomatoes and the Half & Half cream. Add salt and any other extra seasoning of your choice (basil and oregano are good here.) Let this simmer for about 10 minutes. After it's simmered, mix cornstarch with room temperature water (only about ¼ cup) and add to the sauce a little at a time until it reaches the thickness you like. This is only necessary for thickening a little since I used Half & Half instead of heavy cream. If you want, sub in heavy cream and no cornstarch. Meanwhile, boil water + a little salt and add farfalle pasta; cook until al dente and drain. Pour the pasta into the sauce and mix all together. The noodles will absorb the sauce this way. Serve with a little fresh grated Parmesan. Need Dinner Ideas? Check out our other Recipes of the Day! I have made this more times than I can count, and it’s always delicious. Fast and easy too. Can’t beat that. Thanks! Oh good, so glad you like it!